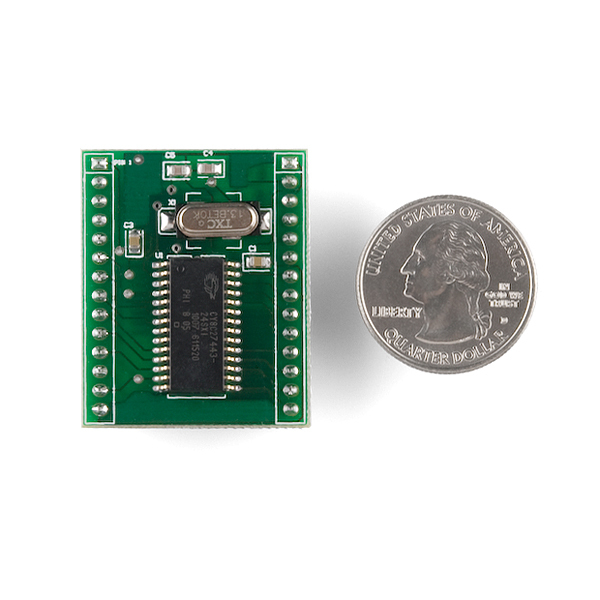 The SMB130 is a 28 pin DIP module that includes all necessary components for a 13.56 MHz RFID MIFARE®, aside from a PCB antenna. 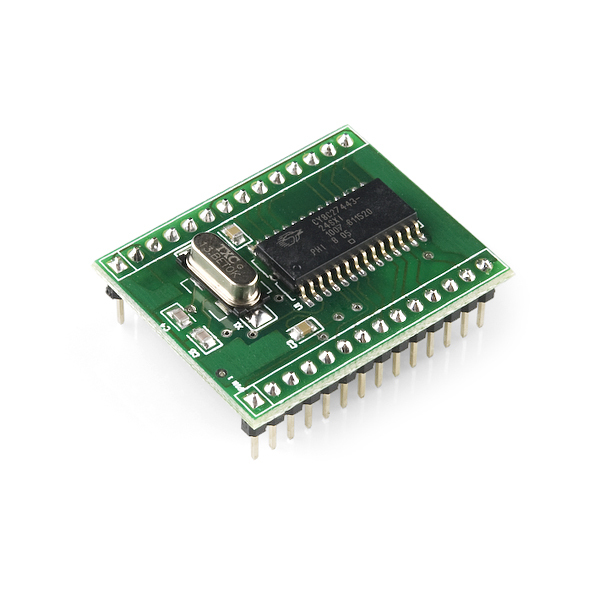 The module communicates over UART or I2C with simple protocols. It also has 2 general purpose inputs and 2 general purpose outputs for switches, relays, etc. Check below for MIFARE® RFID tags. Note: You will need an antenna or evaluation board for this module to work. Check the related product below. The SM130 does not seem to have that much of a range with the associated RFID Evalulation shield's trace antenna [ [https://www.sparkfun.com/products/10406(https://www.sparkfun.com/products/10406) ]. Hereâs a demo [ https://youtu.be/FLjV5BT9slg?t=4m38s ] with one tag being read at a time. Depending on the RFID tag used, the read range is usually 1 inch or less. Looking online, it appears that there are other antennas from the manufacturer that you can explore for options instead of using our RFID Evalulation Shield's trace antenna => [ https://shop.sonmicro.com/Mifare/PcbAntennas ]. The Mifare classic 13.56MHz RFID tags listed in our catalog [ https://www.sparkfun.com/search/results?term=MIFARE+Classic%C2%AE+1K+%2813.56+MHz%29 ] use the ISO/IEC14443 Type A standard protocol. As stated in the datasheet, this is compatible with Mifare Classic 1K, Mifare Classic 4K, Mifare Ultralight RFID tags. Theoretically, the 13.56MHz RFID reader should work if the RFID tags purchased outside of our storefront use the same protocol. There were a few comments below that indicated that it works well with NFC compatible-enabled devices. The datasheet for the SM130 [ https://www.sparkfun.com/datasheets/Sensors/ID/SM130.pdf ] provides information about anti-collision. I have not tested the SM130 but the SM130 can read multiple tags with the anti-collision feature. With some clever programming, you could read multiple tags with the SM130. Looking online, there was a customer that provided a demo with the SM130 and shield. They were able to read 5x RFID tags simultaneously => [ https://www.youtube.com/watch?v=nTI08vvN_I8 ]. They had to turn on/off the antenna to detect whether a tag has been taken off the reader. We do not have any information in our knowledge base about the maximum number of RFID tags that can be read with the SM130. Maximum Number of RFID Tags? We have not tested the maximum number of RFID tags with the MiFare SM130. I am not sure what the maximum number of RFID tags that can be read with SM130. Thanks for posting the link to this. For newbies out there like me, buy the Sparkfun evaluation shield. Overall, this was very easy to get working. One evening and I had a functional RFID reader! Why to use this chip (SM130) ? Look at PN532 (from NXP) - while SM130 can work only with Mifare Classic, PN532 can read (and write) almost anything that operates on 13.56 MHz. UART, I2C, SPI ... Just Google it, there are even breakout boards and Arduino shields, complete with antenna on the PCB, true plug and play. It is a pity Sparkfun did not create a breakout board for this amazing chip. Hi guys, so I've been having a problem with the UART on the SM130. For some reason I can't get it to communicate with me. All I'm trying to do is send the command to read the firmware version (FF 00 01 81 82 --from datasheet) but no response. I also tried other commands but again, no response. Whenever I reset the module's power I receive this message: FF 00 08 81 55 4D 20 31 2E 33 64 in which the payload data is "UM 1.3d" which I assume is the current firmware version. This makes me think that my UART is connected correctly (at the default 19200 baud). Has anyone else had any issues like this? Thanks! Would this work with a DesFire chip? The RFID shield listed in the related products (DEV-10162) has a PCB antenna built in for everyone who is interested. Is the external antenna needed? If it is needed, why don't you sell it? As per the product description, you need an antenna. Why isn't one available on Sparkfun? Perhaps because this module is supposed to be integrated into your own design which would include your own PCB antenna. Perhaps SONMicro didn't want to sell their PCB antennas through SparkFun. Either way, it isn't hard to make your own or buy one through SONMicro. SonMicro has a $69 minimum purchase. Which is annoying for a $3 antenna. Anyone found somewhere to get the antenna from? Hey Everyone, I'm sorry for this issue. I will look into why we don't have antennas for this product. It makes a lot of sense that we would carry it as well. However at this time, it looks like we don't have one. I'll get to the bottom of this, and hopefully be carrying those sooner than later. I'd really like to start working with one of these, but PCB antenna design seems a bit daunting. I don't normally etch my own PCBs. Is there somewhere I can get a compatible antenna? I have a few of the antennas laying around...I had to make a large purchase to fall into the minimum purchase range. I have the smallest and the largest sizes. Here is the antenna board, sorry for the delay. It's also in the related items now. Is there anyway this could be used in a car door persay, so when i walk up to it with my phone in my pocket it unlocks the door. Like the newer cars. Dear fellows, I want to design my own RFID tag reader. I want the range of at least 10 meters by using arduino board. Any can help me please. What enclosure do you recommend for this product? Does anybody know if this is compatable with libnfc? The chip doesn't look like a PN53x. anybody get this working with Raspberry Pi and can share some insights ? Anyone familiar with a large (8" - 15" square) 13.56 MHz antenna that can be used with this? I can't find one on digikey or sonmicro's website. I am trying to use this reader without the evaluation shield. I have gotten the reader to communicate with the arduino but i cant get my antenna to work. I am trying to use an antenna made of coiled wire. The module has 4 pins for the antenna but if my antenna is coiled wire how do i get the antenna to work any help would be appreciated. It's not easy. You need to tune the coil to 13.56MHz using a filter. I'd suggest following the eval board schematic and layout as much as possible. However, if you are using a different coil than what is on the PCB, then the values of the caps will need to be changed. The way I tuned the PCB antenna was that I used adjustable caps. I simply moved the capacitor values around until I got a good read. Then I measured the capacitance off of adjustables and used those values. Also, the module has two pins for the antenna (pins 24 and 26), which connect to each end of the coil, and two ground connections that just need to be connected to the main ground. Would it be possible to amplify the output and build a larger antenna for greater read range with this module... say 1 meter? I too need longer operating range, but I only need 4 to 6 inches. The range I am getting now is about 1 inch. I'd like to make an RFID scanner that can sense when someone with a tag walks through a doorway and read an ID off that tag. Is that something that this module can do? If not, anyone have a suggestion for one that would work? Thanks! I'm interested in reading multiple tags in a field (say 6 tagged books) and detect when and which own ha been removed. Is that possibl with the firmware upgrade that was described by IDfun? How much of this modules can be connected into one i2c network or how much individual i2c addresses i can set? From reading the datasheet, it appears that this device has a single fixed address, therefore normally you could only connect one device to an I2C bus at a time. There may be methods to use the reset pin to hold multiple devices in reset except the one you're communicating with, but that may not be useful in an environment where any device might encounter a tag at any time. You might also contact the manufacturer with this question; they could possibly provide different firmware versions with different addresses. You can set the I2C address in the utility. You need to connect it via USB using something like an FTDI cable as if you were flashing the firmware. Then you run the reader/writer/config utility and under I2C address you can change it. The default setting is like 99 and most Arduino projects want it to be 42 or 46 or whatever (don't recall). Thank you for your help. I'm trying to build a system, that holds 30 RFID readers at one time. Which solution you could recommend? 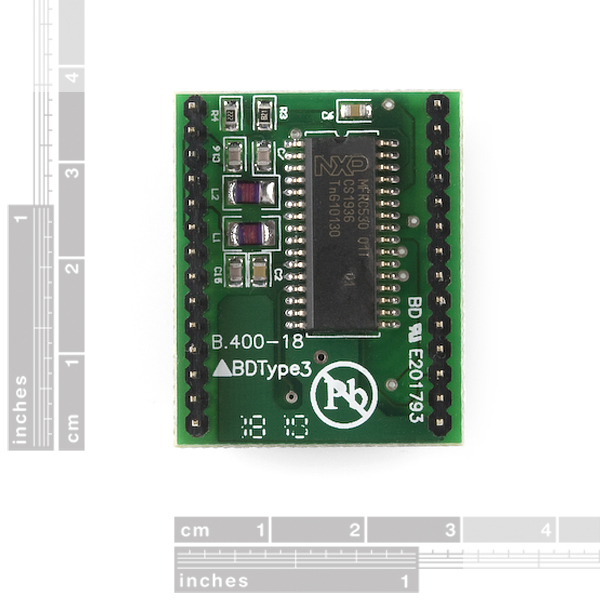 If the manufacturer doesn't have any better advice (such as supplying custom firmware with individual I2C addresses), I would personally go with the RFID Shield in the below related products, along with an Arduino Pro for each location. It will increase the price somewhat, but because you'll have full access to the Arduino hardware and firmware, you can use whatever communications medium you wish (serial, I2C, wireless, WiFi, Ethernet, etc.) Good luck! If you could post the tutorial, it would be greatly appreciated. Im trying to get my ducks in a row for my project. could you please post a guide to makeing a 13.56Mhz antenna. I have been looking for one and all seems like i have to spend over 70$ to get one. Thanks. I just need an antenna. I'm using the PN532 and just need an antenna. Any update on this tutorial? Sounds quite useful! After some tries, it worked on a 3.3V system. No need logic level converters. Make sure the reset pin of the SM130 is set to 0! Otherwise, the module stay in reset state. I'm creating an rfid door locking system. All i would need for this system to work is this reader, the tag, and the evaluation board, correct? I don't need a microcontroller or anything for this to work right? You may want a microcontroller to interpret the data that comes in from this module. That way you can say "Yes, this is a valid tag" rather than accepting any tag (that would be a big no-no). Also with a microcontroller you could get a stepper motor connected to it and control everything from there. check it out if you are looking for help with the SM130 or add to the document if you haave anything to share. I'm going to be working on a school project using a similar setup to what your document describes. If you wouldn't mind, could you add an email to the end of the document that I can contact you at if I have questions? I'd like to know if it's possible to read more than one ID/tag at once. In my project, I will have three/four IDs near the antena, but I don't know if it's a problem. Does someone already tested reading more than one ID near the antena. Is it work? Thanks. I'm also looking for the answer to this question. I know that the MIFARE tags support an anti-collision function, however I do not know whether the SM130 supports that function as well..
Has any one here successfully scanned multiple objects in the field of detection with the SM130? When this is back in stock? I'd like to try to use Finnish public transport card as an access card. where can i buy rfid cards that would work with this? Can someone tell me what is the needed inductance for the antenna? I don't see mention of it in the datasheet and I don't know what the internal capacitance of the reader is. I also don't really see mention of the inductance of the antenna on the breakout board either. Does this module have the anti-collision feature that allows to read from a particular tag amongst many tags that fall within the range? I'd also like to know if the output of the module is TTL compatible. Hello. I have the same question, about reading some tags in the antennas range, possible just with the anti-collision feature. Did you got an answer? does this work with the Tag-it Transponder Inlays ? can this be used toRead/write or just read? According to the datasheet, it is "[a] Complete Read/Write module excluding only antenna." Will this Module allow for multiple tags to be scanned simultaneously? I was looking at the ID-20 RFID Module (125 kHz), but I know that it cannot do multiple tags. The posts on the ID-20 page state that in order to do multiples you would need a HF unit. I'm assuming HF means "high frequency". Is this SM-130 (13.56 MHz) "high frequency" enough? Thanks. I managed to read multiple tags using the SM130 with a different firmware version provided by SonMicro. The method is described in this document. This command seeks and selects a Tag as soon as the tag presents in the field. On receiving the command, the module executes an Anti-collision and Select command sequences. As soon as the tag enters into the RF field, then module selects the tag and sends the serial number of the tag as response. It seems that this anti-collision system allows multiple tags readings. Did you already got the answer? Thanks. For those who want to flash the SM130 with I2C firmware, I've written a blog post about how to do so from platforms other than Windows: http://blog.notdot.net/2011/03/Using-the-SM130-RFID-NFC-reader . That post also links to the beginnings of an Arduino library for using the reader. I finally managed to obtain an antenna off SonMicro, the SM130 it states that it has an I2C interface however it doesn't ship with that firmware installed by default. It only ships with the UART firmware, you apparently have to contact SonMicro to find out how to reflash it, anyone manage to do this? Here are the Antenna design documents from NXP's website. I am still trying to build this, will give feedback if I succeed. Any idea what range is reasonably reachable using this module and a standard antenna ? 4cm ? 15cm ? more ? If you buy the modules direct from sonmicro, they're only $20 instead of $30, and you can buy the required antenna for $3 as well -- only problem, they have a minimum order of $70, and shipping is another $30. 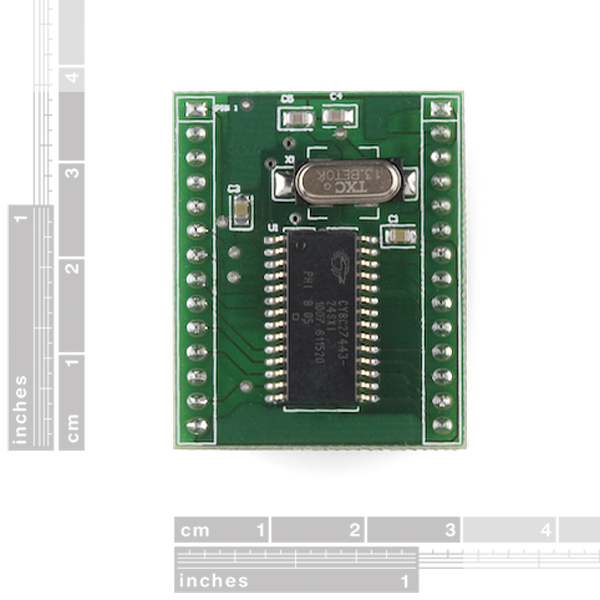 If you want a module with an antenna, google "seeeedstudio 13.56Mhz RFID module - IOS/IEC 14443 type a" for a place to buy it. It's the same price as this one, but includes an antenna. Recently purchased. Would like to be able to buy the antenna from Sparkfun. This unit cannot be used without one. I second this motion. I'm currently trying to create my own but with no previous "antenna" experience its proving quite troublesome. Even if you provided a simple video as to how to make a simple DIY one (tuned to 13.56MHz) that would be better than nothing! Any update on an antenna for this module? will this work with the Mifare 1k tokens? If you look at the data sheet, it says that the Mifare 1k, 4k, and Ultralight are all compatible with this module.